Climbing involves risks that every climber assumes. Routes vary in difficulty and in the amount and kind of experience and preparation needed to enjoy them safely. Routes change or deteriorate over time. Climbing conditions change daily due to weather and other factors. A route that is safe in good weather, or for a highly conditioned, properly-equipped climber, may be completely unsafe for someone less conditioned, or for everyone under adverse conditions. Most importantly, the fact that a route is described on this website, or in the book, is not a representation that it will be safe for YOU. Read the website DISCLAIMER. Minimize your risks by being knowledgeable, prepared, and alert. General discussions on climbing are available through many good books and public courses on the subject. Take advantage of these resources and increase your knowledge. Grizzly bears are spreading out across Idaho. You can encounter grizzlies in many of the northern Idaho mountain ranges and all along the Idaho-Montana border from I-90 to Yellowstone National Park (including the Bitterroot, Beaverhead, Centennial, and Henrys Lake mountain ranges). The bear population is also expanding its range into the Selway Bitterroot and Frank Church River of No Return Wildernesses as well. As part of the Greater Yellowstone Ecosystem, the Henrys Lake Range and the Centennial Mountains are especially prime habitat for grizzly bears. We highly recommend you visit the National Park Service’s Staying Safe Around Bears page before venturing into grizzly bear habitat. Also, if your climb is in grizzly bear or black bear country, check with the appropriate U.S. Forest Service Ranger District to find out about current bear conditions. 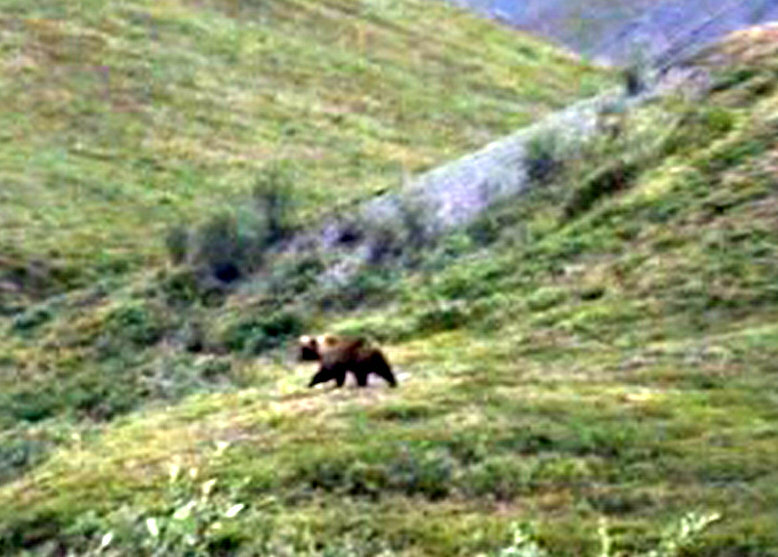 Grizzly from a distance. Tom Lopez photo. Expect the unexpected when driving in the mountains. Historically, recreational use of Idaho’s mountains has taken a back seat to logging, mining, and grazing. Consequently, road access to many places is poor. Recreational use has drastically increased over the last 20 years and land managers have slowly improved access routes in response. Nevertheless, you must plan for and be ready for difficult and dangerous road conditions. Almost all of Idaho’s mountain roads (paved, gravel, or dirt) will, depending on weather conditions, require the use of four-wheel drive (4WD) or a high-clearance vehicle at one time or another. 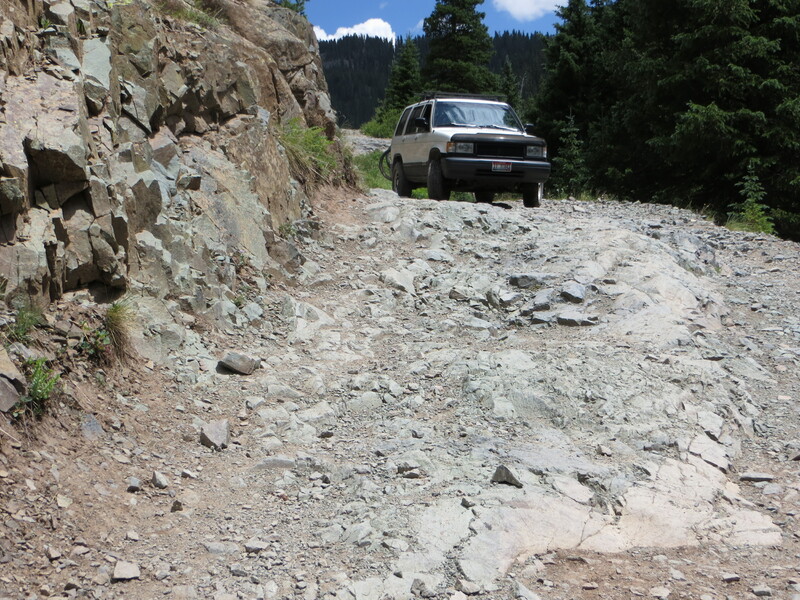 In many places, you will ﬁnd that the approach to a climb can be accomplished only on foot or with 4WD. To be clear, 4WD refers to a vehicle with a transfer case that includes four-wheel drive high and four-wheel drive low, skid plates and at least all-terrain tires. The 4WD designation does not include all-wheel drive vehicles or two-wheel drive passenger vehicles. Most vehicles are not 4WD. Rugged travel. Margo Mandella photo. Many roads are so poor that they require not only 4WD but also the driving skills to use the vehicle safely on treacherous terrain. The book and this website attempt to identify all roads that require something more rugged than a passenger sedan, stating “a 4WD is recommended” or “a 4WD is required.” Nevertheless, this is no guarantee that roads not identified as such may require a 4WD. You must assess the drivability of any mountain road when you are using it. If the road deteriorates or becomes unsafe—STOP! Also, keep in mind that conditions change from season to season and year to year and roads listed in the book or on this website may have become impassable. Be prepared for the worst on every trip, because trees fall across roads, stream crossings can vary from inconsequential to life threatening, mud holes come and go, and vehicles break down. Always think in terms of self-rescue. Carry extra water and a good tire jack. Make sure there is air in your spare tire. Consider taking tire chains, a shovel, and an ax or small chainsaw if you are going to one of the state’s many remote trailheads. Most of all, be prepared to take your time, drive slowly, and expect the drive to take twice as long as you planned! Also be prepared for water crossings…. Since 1950, 176 climbers have been buried and killed by avalanches in the United States (Climbing.com and Avalanche.org). 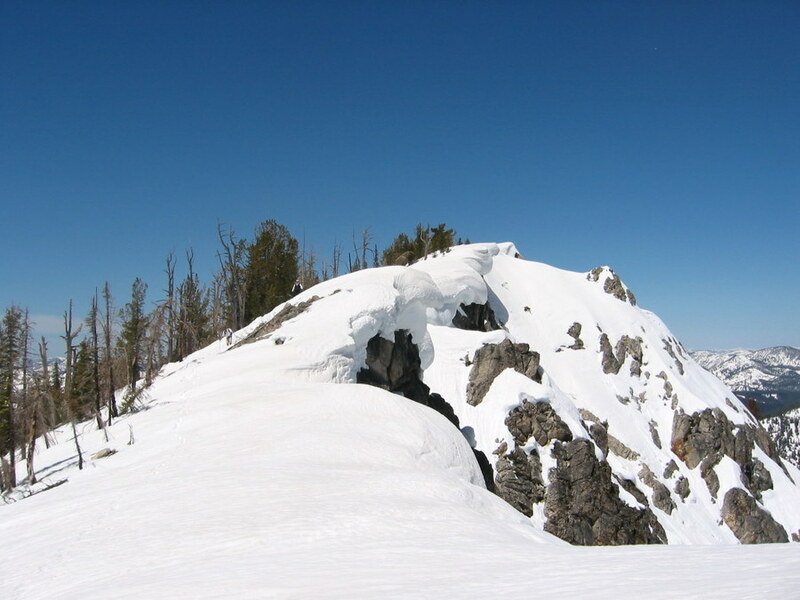 When the first edition of the book was published in 1980, and even when the second edition was published in 1990, winter climbing was not popular in Idaho. But in the last 15 years, winter ascents and skiing/snowboarding Idaho’s backcountry peaks have become increasingly popular. As of 2018, most of the 41 Idaho avalanche fatalities were snowmobilers, followed by skiers and snowboarders. 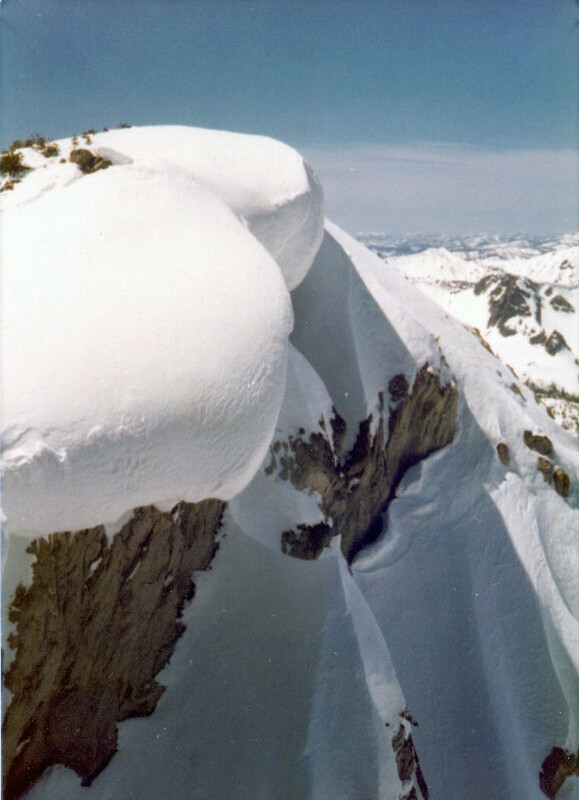 However in 1977, two climbers from Idaho, Vaughn Howard and Guy Campbell, died when they triggered an avalanche on Mount Borah’s Northwest Ridge route. In 1987, David Probst died in a rare combination of events involving an avalanche on Mount Borah, and in 2005, Jarad Speers died when he triggered an avalanche while snowboarding after summiting Castle Peak. Most avalanches occur in winter, particularly from December to April, though avalanches involving climbers occasionally happen in the summer months. However, avalanches can, and do, occur anytime conditions are right. Winter climbing is more dangerous than during dry conditions because of cold and avalanche danger. Most routes in the book and on this website are not recommended in winter because of increased hazards related to winter conditions. An avalanche is a rapid flow of snow down a hill or mountainside. Although avalanches can occur on any steep slope given the right conditions, certain times of the year and types of locations are naturally more dangerous. While avalanches are sudden, there are typically a number of warning signs you can look for or feel before one occurs. In 90 percent of avalanche incidents, the snow slides are triggered by the victim or someone in the victim’s party. Avalanches kill more than 150 people worldwide each year. The National Weather Service provides current weather conditions and forecast information to regional avalanche forecast centers that in-turn issue avalanche forecasts. Avalanche warnings and special advisories are included on NWS websites and broadcast over NOAA Weather Radio. Refer to your local avalanche center for current snowpack conditions! The NWS also provides the following information on how to stay safe. Avalanche.org provides introductory online training and can direct you to a hands-on class in your area. Slope: Avalanches generally occur on slopes steeper than 30 degrees. Determine if you are on or below slopes that can avalanche. Snowpack Volume and Stability: Recent avalanches, shooting cracks, and “whumping” sounds are signs of unstable snow. Find out if the snow is stable, know how to dig a test pit and interpret what the pit shows you. Trigger: It doesn’t take much to tip the balance. People, new snow, and wind are common triggers. Refer to your local avalanche center for current snowpack conditions! Avalanche survival rates plummet after about 15 minutes for victims who do not die from trauma. Saving your partner is up to you! Practicing realistic scenarios beforehand is essential. You see an avalanche happen or see evidence of previous slides. Cracks form in the snow around your feet or skis. The ground feels hollow underfoot. You hear a “whumping” sound as you walk, which indicates that the snow is settling and a slab might release. You see surface patterns on the snow made by the force of strong winds, indicating snow may be deposited in dangerous drifts that can release. Take the time to learn about avalanches from a professional. Find the avalanche center covering the area of your interest, and heed all warnings. Beautiful snow features to look at from below, but deadly to cross. 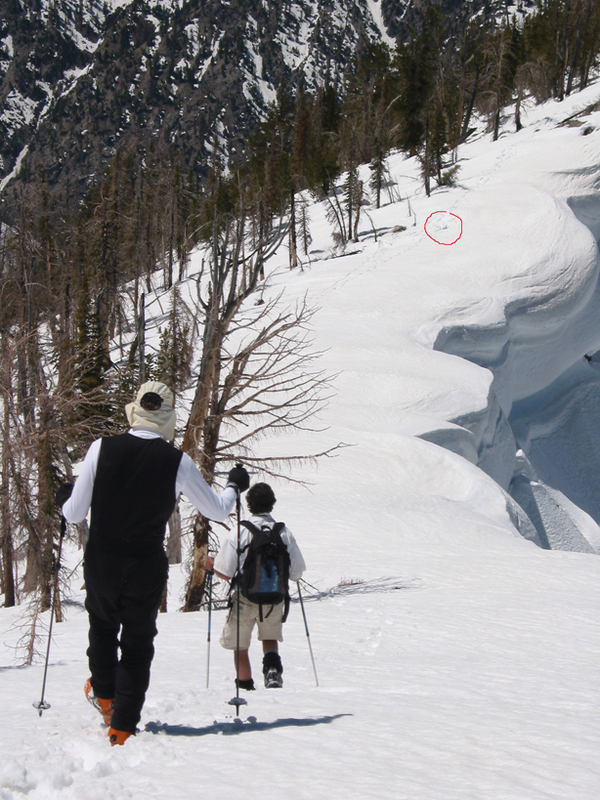 Cornices present a substantial hazard to all types of mountain travelers. Probably the most dangerous aspect of a cornice is that you will likely not know that you are standing on one until it breaks from underneath you. When that happens you will most likely not survive. Mountain Skills Academy has an excellent discussion of cornices on their website. Snow-covered rock crevasses are a difficult-to-discern hazard you may encounter during snow travel. You will often encounter these hazards in snow-covered rock gardens or over/through rock outcrop areas. 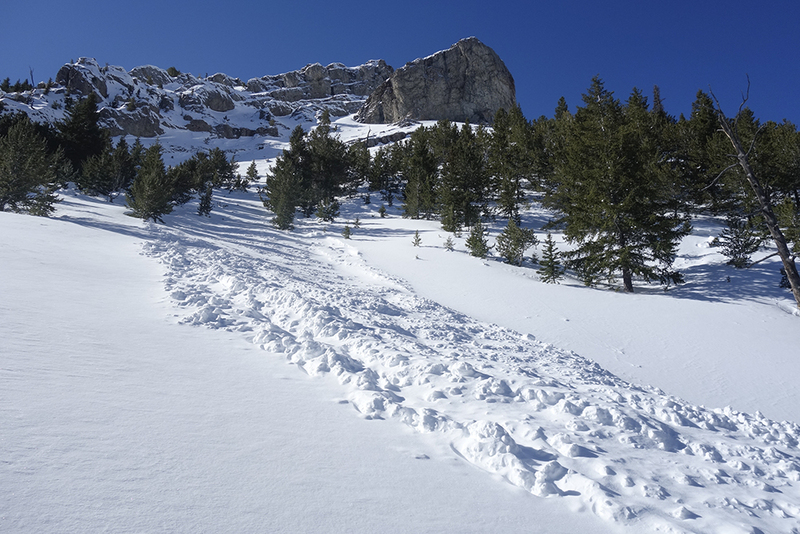 Careful research of your terrain before your trip, in snow-free conditions, may help you to identify and avoid these areas. Google Maps may be a good tool to see where these rock gardens and outcrops exist on your proposed route. Using your poles to probe as you travel may also help. Be prepared to self-rescue and partner rescue with the tools you carry and knowledge of extraction techniques. When dealing with hazards like these your best bet is to retreat/backtrack to the solid terrain that you already safely crossed and reassess your options. 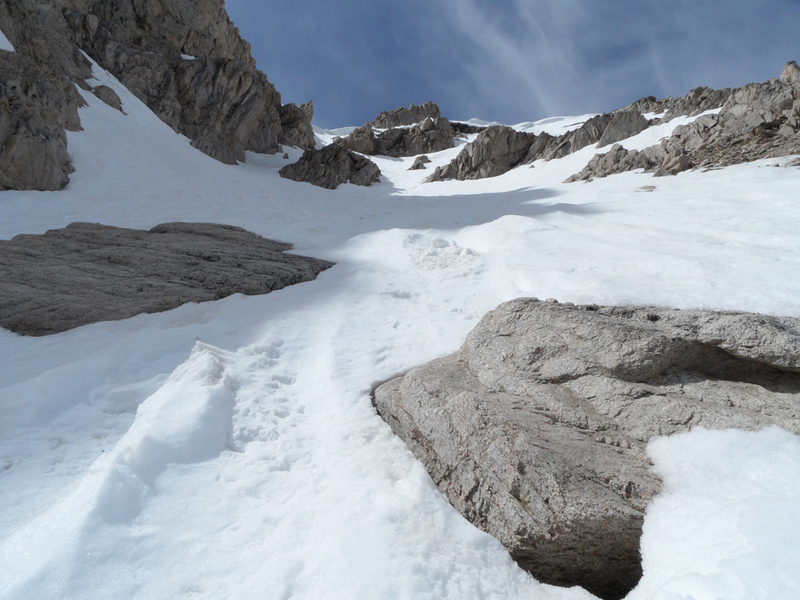 The following three-photo series from John Platt shows experienced climbers avoiding a cornice. However, they also soon discovered they were crossing an area with snow-covered rock crevasses, large enough to fall into. Climbing over a snow-covered rock outcrop. Staying well away from the cornice edge? John Platt photo. Fall into a rock crevasse, at the root of the cornice. Note that this is after climbing up a few feet. John Platt photo. Looking back where the fall into the rock crevasse occurred. Notice how far from the cornice edge the fall occurred. John Platt photo. 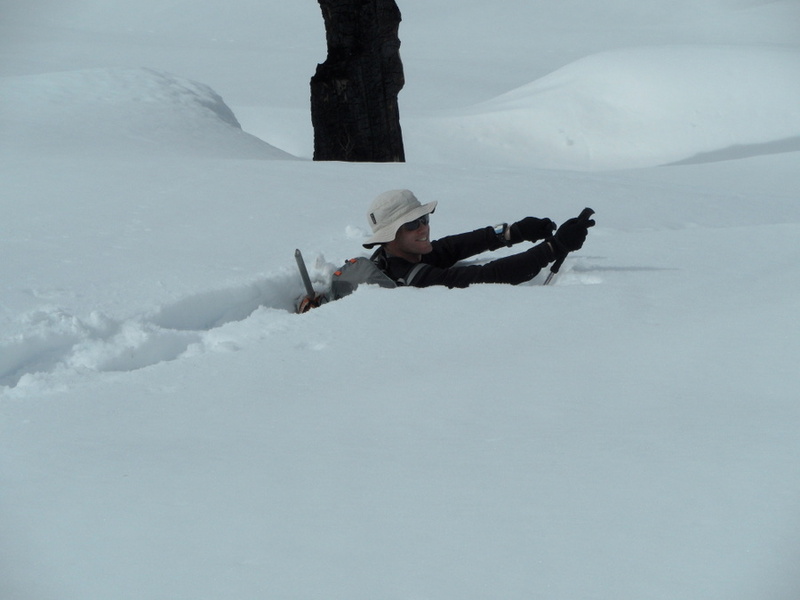 A deep snow, or tree well, immersion accident occurs when a person falls into an area of deep unconsolidated snow and becomes immobilized and suffocates. Deaths resulting from these kinds of accidents are referred to as Snow Immersion Suffocations (SIS). Most tree well incidents have occurred at ski resorts in the western United States and Canada, though the same risk is present wherever deep powder conditions are found. As a climber, you are less likely than a skier/boarder to fall into a tree well inverted, but it can still be done. You may drop into a well if you stray too close to a tree on a glissade, or you may simply step or back into a well while you distracted or are seeking shade or shelter from the elements. Of course, if you are skiing or boarding your descent your risk for tree well immersion and SIS is higher. However, most tree well immersion accidents are completely avoidable. Outright avoid trees and the well around them as you are climbing and descending, and use your hiking/skiing poles to probe for snow depth and stability if you are seeking shade or shelter near trees. Example of a deep powder near full-immersion. Dave has his snowshoes on. John Platt photo. If you feel yourself sliding into a well try to stop the movement, grab onto branches or throw yourself to the ground spreading your weight. If you can’t stop your slide do everything you can to make sure you don’t go head first into the hole. Don’t panic after you have fallen in – any movement will just encourage further snow to fall on you, restricting your breathing. Grab onto the trunk or branches – this way you should not fall any further into the hole. If you can, carefully move your head to any available pockets of air or clear a small space around your mouth. Shout for help – hopefully, your climbing buddy will hear you and come to help you out of the hole. If you’re alone – don’t panic, you can still get out of this situation. Try to turn around or pull yourself up using the tree as leverage. This will be difficult but take your time and persevere. Once upright, spread your weight across the snow and push yourself clear. Numerous websites provide information about how to avoid falls into tree wells and what to do if you do have fall into one. Here’s a couple – Check them out! A tree well demo video shows you how much of a hazard tree wells can be. In 1987 a climber died on Mount Borah in an accident involving an uncontrolled self-arrest, combined with falling into a water-melt tunnel, and being buried by an avalanche he triggered. 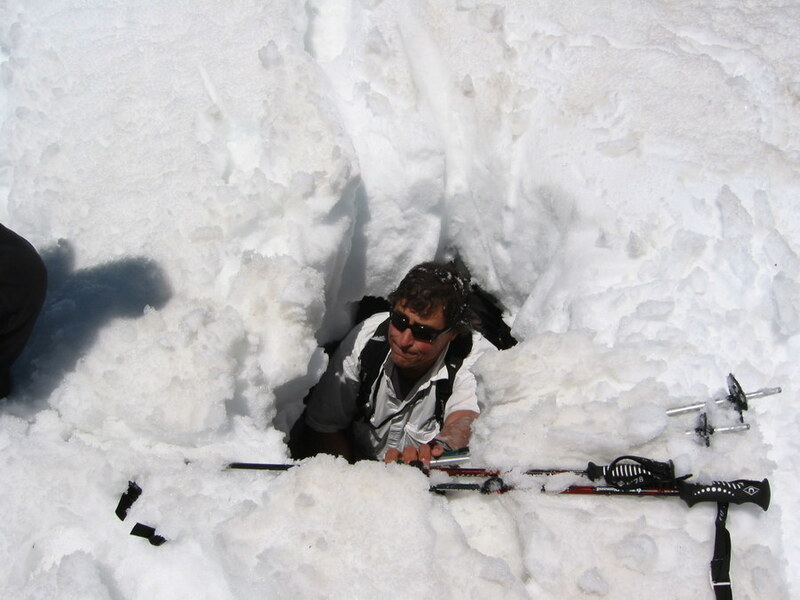 It’s important to assess your terrain for the potential of water-melt tunnels before selecting your descent path. Mountain climbing is dangerous. Many people die or are injured every year while engaging in the sport. 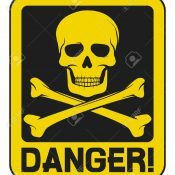 This website and its contributors make no warranties or representations of any kind regarding the accuracy of the information contained on the website nor assume any liability for your use of this information. The information presented on the website may contain factual errors and subjective opinions regarding routes and ratings. Please read the entire Disclaimer. Remember, it is your responsibility to learn the skills necessary for safe travel in the mountains. You assume any and all of the risks associated with mountain climbing. You solely are responsible for your actions in the mountains. Climb Safely So You Can Climb Again!